A cheap long gun safe for just a few guns can be difficult to find. Many of the best long gun safes offer too much unnecessary space, and most rifle users only require storage for a few guns at most. If you are one of these people, take a look at the Barska Quick Access Safe. Although it does lack some features, it is undoubtedly fast to operate and great value. This safe is a quick access biometric safe. 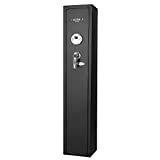 Biometric safes have the advantage of being easy to use and fast to access when you need it. This particular safe has the ability to store up to 120 fingerprints that can be used to access the safe. The biometric scanner is responsive and works flawlessly. In the case that the finger scanner does fail, all is not lost. The finger scanner can be bypassed with the included key. With space to hold up to 4 rifles this safe has fairly good capacity. There is an upper compartment that can be used to store excess items, and a holder places guns into position. The storage compartment can be removed to make more space for your guns. It is important to note that the storage recommendation of 4 guns is without any accessories fitted to them. At 52 inches tall the safe makes maximum use of the space, and the interior provides enough space for the majority of long guns. The safe also has 6 spots for mounting it to the wall or floor, with everything you need for installation included. You can read more reviews on the Barska Quick Access Biometric Rifle Safe here. Storing rifles can be expensive, and whilst some gun enthusiasts may need a high capacity safe, for most of us limited storage space will do. This safe has several features that make it great. To access the safe, you need to use the biometric finger scanner. Programming this is easy. There is a button positioned inside the door which you press and close the door. Upon doing this, you position your finger onto the scanner until you a beep. Using this method, you can store up to 120 fingerprints. Another great feature is that that there is the option to mute audio feedback, providing the ultimate stealth safe. The compact design makes this perfect for any household. It does not take up much room and does not weigh a phenomenal amount, whilst still offering space to securely store up to 4 rifles. The amount of rifles you can store will depend on the size of your own rifles, and this is without pistol grips, optics etc. There is also limited space for anything else in the upper compartment, which is removable. The mounting points at the back work well to place to safe into position. The safe is not fireproof which is perhaps the biggest disadvantage, although it is worth noting that a safe in this price range is not likely to include fireproofing. This is a sacrifice for the capacity it offers, and whether this is worth it is up to you. This safe does what it is meant to do – storing guns and other goods safely away and making them accessible in an emergency situation.